Kalamalka Lake at the southern tip of Vernon has been commonly referred to as the ‘Lake of Many Colors’ and is located at the southern tip of Vernon. 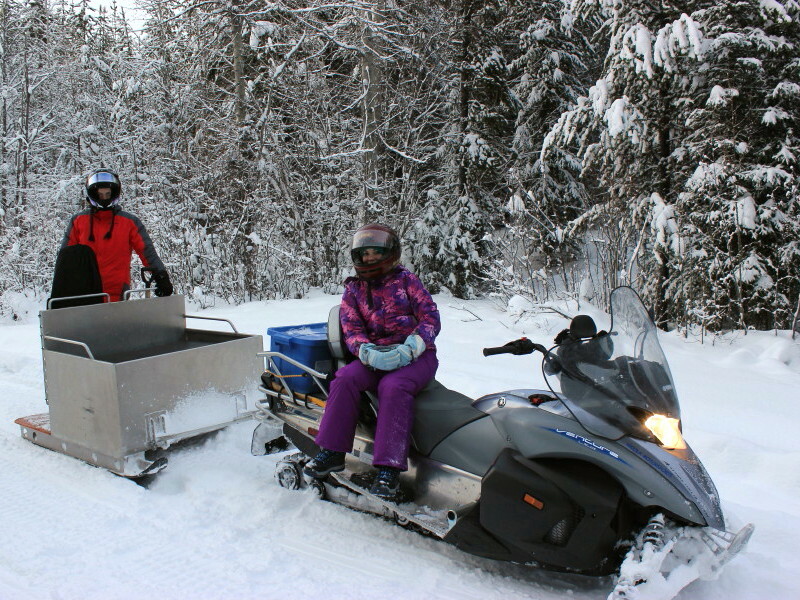 At 16 kilometers in length, the blue – green waters of Kalamalka lake are home to Trophy sized Lake Trout, Rainbow Trout to 12 pounds and good numbers of Kokanee. 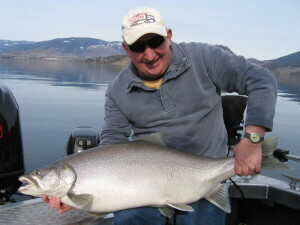 In fact, many local anglers agree that the next world record Kokanee may come from Kal lake. 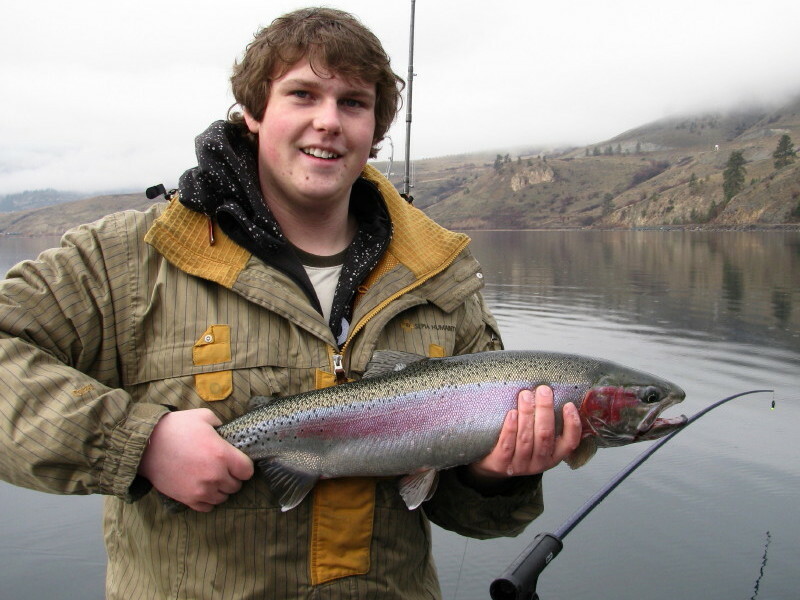 The record was previously from Okanagan lake at 9 pounds, 6 ounce and was broke in 2010 at 9 pounds, 10 ounce by an angler at Oregon’s Wallowa lake. 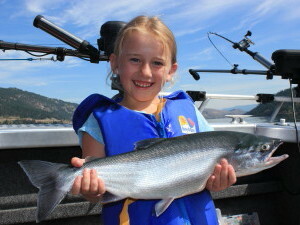 In the past few years there have been reports of 8 pound plus Kokanee caught from Kalamalka lake. 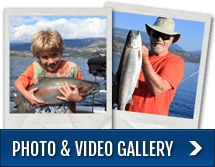 For a guided fishing charter on Kalamalka lake we offer both half day (4 hours) and full day charters (8 hours) and provide cleaning and bagging of your fish at the end of the day should you wish to keep a few for dinner. 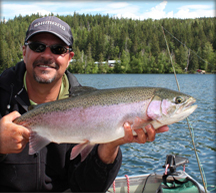 Please note, this applies to Rainbow Trout and Kokanee only, we promote “Catch and Release” for Lake Trout. The best fishing time for Lake Trout is November through to April and for Kokanee and Rainbows, April through to November. We supply all fishing tackle, bait and safety equipment needed. 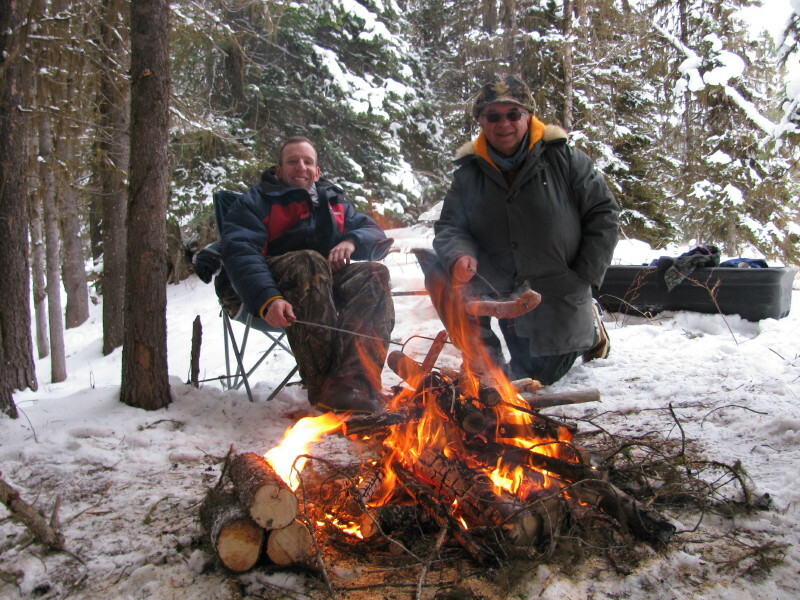 You are responsible for your fishing licence, food and drinks for the day. Upon request, we can provide a box lunch at $25.00 per person that consists of a breakfast muffin, custom built sandwich, chips, fresh in season fruit or vegetables and dip, dessert and your choice of water, juice or pop. Our fishing method is primarily trolling and when targeting the Trophy Lake Trout and Rainbow Trout we use Shimano Talora rods mated with Tekota 500 line counter reels or for the light line enthusiasts Shimano Convergence rods paired with Ross’s large arbor Momentum fly reels. When Kokanee fishing Kalamalka lake we use Shimano’s Talora Kokanee rods and Citica 200 baitcasting reels for the best in ultra light fun.